Industrial Yarn Diameter, Gauge - Why is it important? 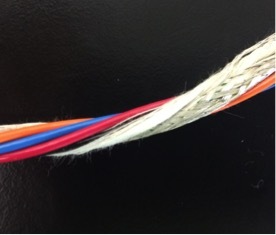 If you manufacture hoses, cables, or sewn products, yarn diameter or gauge is an important factor in determining what industrial yarn or thread type and construction to use. Not to be confused with the linear density or size of the material, yarn gauge is the measured thickness of a cross section of material. For cable ripcords, binders or thermoplastic hose reinforcement, gauge is impacted by having a twisted or untwisted industrial yarn. The width of a flat yarn will be greater than a twisted yarn, so an untwisted yarn tends to lay flat and provide more coverage than the same sized material with twist. Twisted yarn has a round cross-section and therefore will be slightly thicker and have a smaller side to side footprint but will have a taller height profile. An example of this effect can be seen in the picture below. 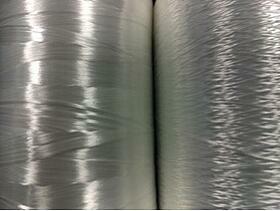 Both of these yarns are 840DN Polyester. 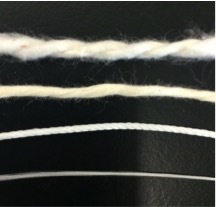 The yarn on the left is untwisted while the yarn on the right is twisted 1.5 turns per inch (t.p.i.). When using material to fill gaps in manufactured cables, or for reinforcement for hoses that require specific strike-through adhesion, various sizes and thicknesses of material may be required. So gauge consistency and choice is critical not only to the cosmetic appearance of wire and hose products but also performance. In sewing applications, the needle size required is based on the thickness of the sewing thread selected. Many customers know what size thread they want to use, but may not know which needle size to use. We’ve put together a handy reference chart for some of the most common sizes of sewing threads used in industrial applications, and a quick needle and thread test can help to verify the right needle is being used. Do you have a specific gauge or diameter requirements for industrial thread or yarn and don’t know where to start? Let us help!